New Delhi: On the face of it, India does not have a jobs crisis. 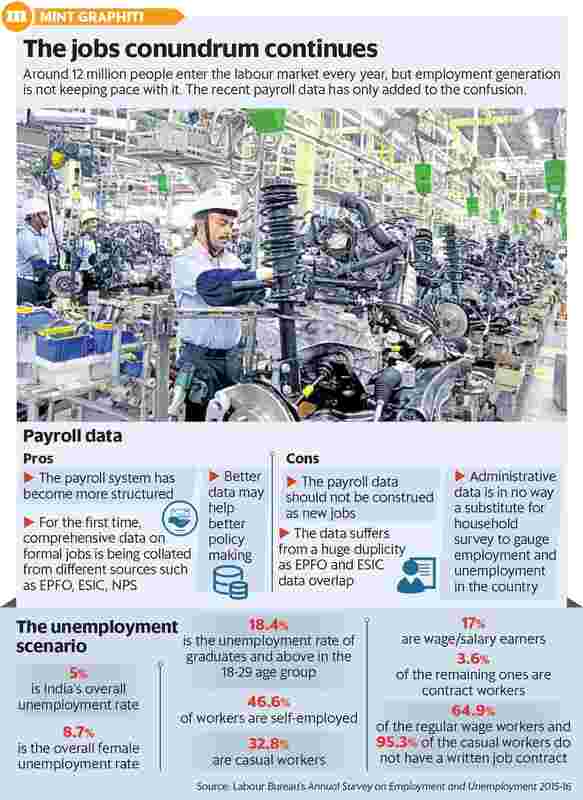 While 12 million people enter the labour market each year, the fresh official payroll data showed 14.56 million new subscribers registered with the Employees Provident Fund Organization (EPFO) in the year to 31 August. During the same period, 9.1 million employees stopped subscribing to the EPFO, indicating a churn. If you take the payroll data on its face value, then jobs are not a problem for Indians. This, despite a double-digit unemployment rate among educated Indians, strikes at industrial belts, protest by teachers to government scheme workers, and farmers across India. According to law, when an organization has 20 or more employees it comes under the EPFO’s ambit. So, if a firm has 19 employees and adds one more to its payroll, all 20 will have to be registered under EPFO. This gives a false picture—that 20 jobs were created instead of just one. Besides, the EPFO payroll data only talks about the organized sector, leaving out the biggest portion of the labour market which is informal. The 2011-12 employment-unemployment survey (EUS) of the National Sample Survey Organization showed that there were 88 million workers classified as regular workers with the remaining 384 million classified as self-employed and casual daily wage workers. “The social security provisions do not fully cover even the 88 million that were reported as regular workers in 2011-12, leave alone the 81% who are not regular workers," said Himanshu, associate professor of economics at Jawaharlal Nehru University (JNU) and Mint columnist. Experts believe the payroll data should not be construed as net job additions though it points to formalization of existing jobs. The administrative reform at EPFO, the amnesty scheme offered to firms to come clean on their employee strength in 2017, implementation of the goods and services tax (GST) and demonetization pushed companies to comply—in a way forcing them to come under EPFO swelling its active subscribers base from around 45 million a year back to some 60 million now. Several experts, economists and trade union leaders believe that while more people under the social security ambit is a net positive, it does not mean India created that many jobs. “This jobs data is unimpressive. Some amount of forced formalization is happening due to factors like GST, but there are other reasons why so many people are moving away from the formal sectors," said Santosh Mehrotra, an economist and chairperson of the Centre for Informal Sector and Labour Studies at Jawaharlal Nehru University. “By looking at these numbers we cannot say if there is or there is not a jobs crisis. There is Labour Bureau’s Annual Survey... and similarly there is the CMIE data that clearly indicate there is a jobs crisis," he said, adding that “a huge thrust is being given to self-employment but can self-employment actually substitute regular jobs? Globally self-employment is synonymous with informality." A.K. Padmanabhan, president of the Centre for Indian Trade Unions, a national trade union, said the recent EPFO numbers are because of better reporting of employees by companies. “Demonetisation and GST have impacted the small-scale industries and the informal sector. But it has certainly pushed some relatively bigger firms to report their payroll numbers better which was earlier largely under-reported," he said. If there are so many jobs, he added, what explains the fact that engineering and management graduates are facing poor placement? According to the All India Council for Technical Education, in 2017-18, while 1.89 million students graduated from professional schools, including engineering and management schools, only a little over a third of them (672,369) got placements. “If you go to any industrial belt, you will find an undercurrent of unrest due to three reasons—first, the jobs or lack of it due to factors including automation; second, the quality of jobs; and third the insecurity in jobs due to over promotion of fixed-term employment," Padmanabhan said over phone from Chennai where he said a workers’ protest is going on at the automobile manufacturing belt. However, the positive side is while the EPFO payroll data has many shortcomings, some argue it is giving for the first time some consolidated number on the formal sector, which was not possible earlier. “It is bringing to the table solid data on formalization and providing a base for a comparative study on formal jobs in future," said R.P. Yadav, chairman and managing director of Genius Consultants Ltd, a leading staffing and human resource firm in India. Notwithstanding the payroll data debate and the overlapping of numbers, Anurag Behar, chief executive of the Azim Premji Foundation, summed up the India jobs crisis in a report titled State of Working India 2018. The jobs crisis, he said, is “not driven by any fear of draconian labour laws or shortage of trained labour, but simply because of the quality, productivity, and safety of such automated systems. The story was identical across other industries".